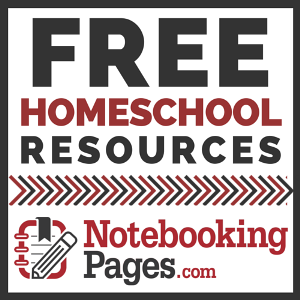 I want to introduce you to a great resource my family has had the pleasure of reviewing for several weeks. 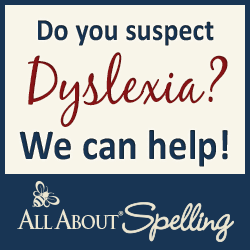 Dyslexia Games was created by a homeschool mother just like me! Sarah had a struggling child and found a way to help her through fun brain puzzles and once she saw that her young daughter was learning through this trick, she with the help of her daughter invented Dyslexia Games so that other children could learn with ease! Sarah's daughter actually drew many of the animals throughout the books we are using. You could read more about The Brown Family on their blog Still Smiling. Once I communicated with the Brown family about their product it was emailed to me as a download file. Obviously, that was simple to use because I just had to save it to my computer and print. You can see below that I printed it and placed it into a binder for my son. Sometimes he removes the pages if he wants. The purpose I wanted to try Dyslexia Games is because Zachary has had a lot of trouble learning to read, has tracking issues and can't really pay attention for long amounts of time. I thought possibly with trying this that it could help with some of the issues Zac have been having. He gets really frustrated when he knows what letters or stories are supposed to say but his mouth and brain say something else. I have watched him for many years struggle and prayed for relief. We started with Series B because of his age (9) but I honestly think he would have benefited from Series A too. We started with Book 1 - Brain Food. There are 8 books in Series B. 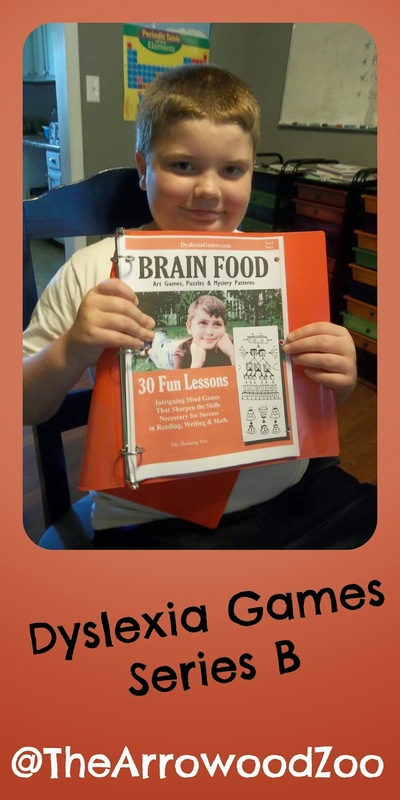 Book 1 is full of 30 awesome games to make your child really "think" about what is going on. I totally see where within the first book it has helped his tracking ability when reading out loud to me. 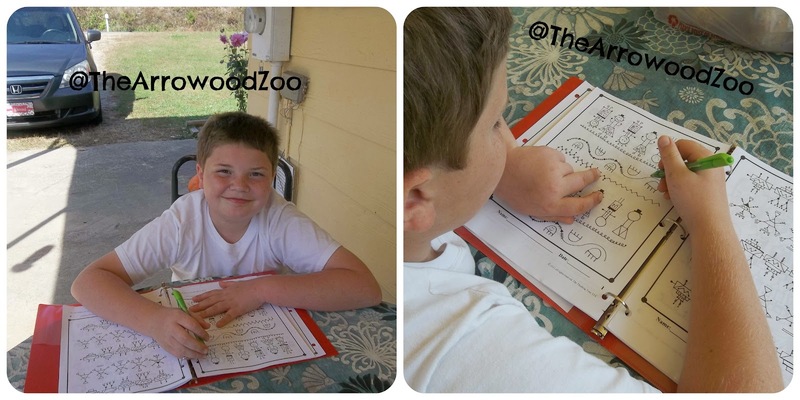 The point in this series is to help improve thinking skills, tracking skills, recognition and writing skills. We have been using these books for 10 weeks now. We spend about 10 minutes a day on these activities. Zachary normally completes the front and back of a page. He actually completed Book 1 within our first 6 weeks of schooling. While we were breaking I printed and hole punched Book 2 into his binder. Book 2 is I.Q. Challenge with 30 games again. This set concentrates on problem solving, intelligence, logic, concentration and memory skills. We have only been in Book 2 for 2 weeks and Zac is doing really good in this book. His favorite so far has been the beautiful butterfly. I actually was begged to print it again just so he could do it twice. I will continue updating our progress with Dyslexia Games but in the mean time if you believe your child is suffering from learning disabilities you should really look into these simple but powerful books. My son doesn't feel like this is "school work" at all. 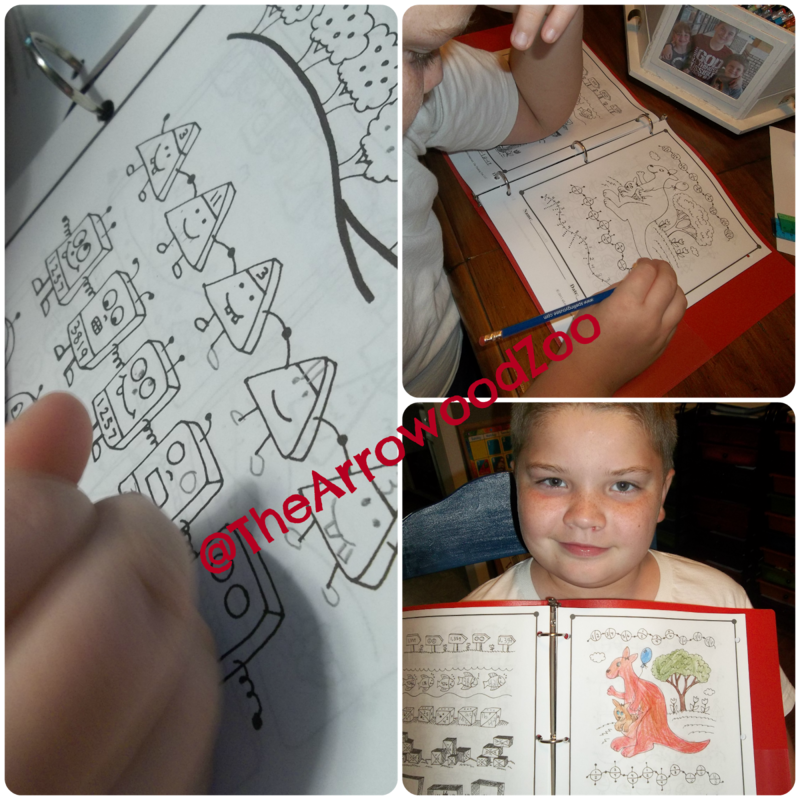 He enjoys working on these worksheets and that is what makes me happy.